When Buddy Holly died in a plane crash in 1959 aged just 22 he was already a star. Today he is a legend. His songs are all-time classics, and no one does them better than Spencer J, whose performance delivers in a big way! Wearing stunning 1950's jackets sourced directly from the USA and vintage horn-rimmed specs, Spencer J has perfected the Holly look as well as the sound. Playing the same sunburst Fender Stratocaster guitar that Buddy Holly used to make Rock 'n' Roll history; with Spencer J's act, you really won't get closer to the real thing. the list goes on. 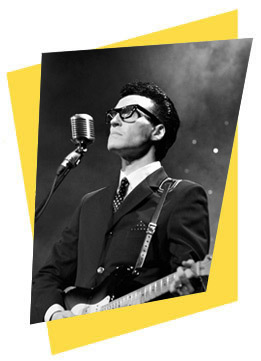 As well as Buddy Holly, the show salutes the Kings of Rock n Roll with golden greats such as Blue Suede Shoes, Bye Bye Love, Summertime Blues, Be Bop A Lula, Great Balls of Fire etc. A great time is guaranteed for all!!! Dance & sing along to the unforgettable hits and re-live the magic of the Golden Age of ROCK n ROLL!